Ped Action Plan Ready Soon. Will SF Commit to Building Ped Infrastructure? 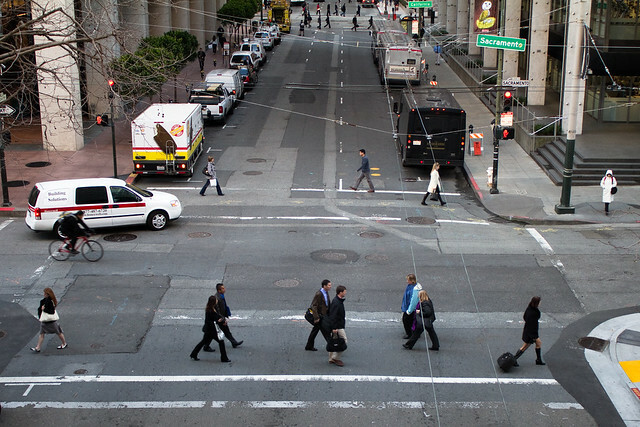 More than a year after the mayor’s Pedestrian Task Force began meeting to develop San Francisco’s Pedestrian Action Plan, the SFMTA said the agency expects to finalize the document by late summer. Unclear, however, is whether the plan will include a measurable commitment to implementing physical pedestrian safety infrastructure. To meet the targets set in former Mayor Gavin Newsom’s Executive Directive on Pedestrian Safety — a 25 percent reduction in injuries by 2016, and 50 percent by 2020 — the document will lay out a blueprint for safety improvements on wide, high-speed streets known as “arterials,” where pedestrians are most at risk of serious traffic injuries, SFMTA Senior Transportation Planner Frank Markowitz told the Pedestrian Safety Advisory Committee yesterday. The plan would also set metrics to gauge the city’s progress toward four goals: Reducing severe and fatal pedestrian injuries, reducing injury inequities between neighborhoods, increasing walking trips as a share of all trips, and providing “high-quality walking environments.” The Task Force expects to begin conducting public outreach in May and to release a draft plan in mid-summer, said Markowitz. “Most of the actions would be implemented in the next two, three years, funding permitting,” he said. The strategies in the plan will include physical traffic-calming measures as well as media campaigns, upgraded speeding enforcement technology (i.e. LIDAR guns), and more thorough data collection on injuries, said Markowitz. Other efforts already underway, he added, include 15 mph school zones — 88 percent of which have been implemented as of last week, according to the SFMTA. The agency also continues daylighting street corners, installing pedestrian countdown signals, and more. Physical street improvements, like corner sidewalk bulb-outs, improved crosswalks, and traffic-calming measures, said Markowitz, will be largely funded by incorporating pedestrian infrastructure into transit and bicycle projects, since dedicated revenues for pedestrian improvements are scarce. Funding would also depend on allocations from Prop B bonds, which include $50 million for pedestrian and bike projects. Markowitz noted the need for concrete metrics to hold agencies accountable to the plan. “We need to increase the visibility of the commitments by all the agencies that are involved in this area — the MTA, Public Health, Public Works, the Police Department, and so on,” he said. Walk SF Executive Director Elizabeth Stampe, who sits on the Task Force, said the organization is pushing for a commitment of fixing ten miles of streets per year, including three miles of major redesigns, as part of the plan. Perhaps the biggest accomplishment of the Task Force so far, she said, has just been getting the various agencies to communicate on pedestrian issues. “I think we’ve moved forward really well on that,” she added. A few easy ways to improve pedestrian safety: longer green lights for pedestrians, prohibit right turns on red lights, prohibit left turns when walk lights are green, prohibit street parking near intersections (especially tall vehicles like SUVs and trucks), lower speed limits. The good thing about bike infrastructure is that it’s walk infrastructure as well — two for the price of one. This, as opposed to pedestrian bulb-outs, which specifically benefit walkers to the detriment of bikers. @saimin:disqus 100% agree, especially with banning right turn on reds. When you think about it, this concept absolutely epitomizes how pedestrians safety has been completely trumped for motorists’ convenience. Intersections are the most dangerous places on our roads, and it makes no sense to further complicate the inherent complexity of multiple roads coming together by allowing some traffic to turn on red. I think the pedestrian advocate groups in SF need to get behind this and start pushing it (they certainly already are pushing daylighting intersections and lower speed limits). Banning right on red would be like banning an Idaho stop for bikes. A driver can largely determine the safety of the turn. Only in select spots, such as across a cycle track, should rights on red be banned. It would make the roads safer to ban all rights on red, but only marginally so; far better to use political capital on something with greater impact, such as bike infrastructure and bulb-outs. If building bike infrastructure kept cyclists off ped sidewalks I’d be all for it, except it doesn’t. Can’t tell you how many times I’ve seen bikes on sidewalks on streets that had bike lanes! Really @pchazzz:disqus . This is getting childish. How about bike infrastructure that kept drivers from parking their cars in it? I can’t tell you how many times I’ve had to go out into fast moving traffic because a driver was too lazy to find a parking space (or meters weren’t running for whatever “free market” reason and all the spots were full). How to pay for it? Why I assume the City will push for the same thing they do for new neighborhoods that have no parks but want parks (like Rincon Hill) – they will want us to form a Community Benefit District so that a parcel tax pulls in the bucks, MJM Management’s pocket book grows as manager of this new layer of nonprofit bureaucracy, and contractors can be hired and the new streetscape job gets done for 40% of what it would cost for the City. If building separated bike lanes will keep bicyclists off the sidewalks, then yeah. And cars that block bike lanes should be towed. of what it would cost for the City. I’m not so sure about that. When making a right turn on red drivers are typically looking to the left for oncoming auto traffic, and are often completely oblivious of any pedestrians stepping into the crosswalk directly in front of them from the right. There is also always the issue of red light right-turners not yielding to peds when the signal changes and the walk light suddenly comes on in the cross direction. The driver is still often looking to the left in these cases, while rolling right. In online comments I always hear about cyclists on sidewalks and how terrible it is. But in the brick and asphalt world I rarely see it. If building bike infrastructure kept cyclists off ped sidewalks I’d be all for it, except it doesn’t. And what’s good for bikes is often times good for pedestrians. Gandy struck up a conversation with a mother and father pushing a stroller while I took pictures of the separated bike paths on 3rd Street. Even though they haven’t ridden a bike in years, they loved the lane. Why? Because it got all the bikes off the sidewalk. ”I used to see bikes on the sidewalk everyday on 3rd. I haven’t seen one in months,” the father smiled while pushing the stroller. Bulb-outs are detrimental to bikers primarily because they prevent the creation of cycletracks — which is the minimal infrastructure required to allow people to bike on most major streets in America — it should go without saying that bikers require full, dignified, safe access to the most direct routes from Pt A to Pt B, which means the biggest/nastiest/most major streets/roads/corridors. Bulb-outs can be deleterious in other ways — like when they force cyclists into the main flow of automobile/bus traffic. Bulb-outs also institutionalize car parking to a certain extent — making the widening of sidewalks difficult to impossible. Good urbanism attacks and fixes the root cause of malignant road design — it does not just cover it up and leave the core problem — autocentricity and autodomination — unaddressed. Put in the cycletracks first, and if you absolutely, positively have to for some reason, then consider giving the cycletracks a soft, wide raise at the corner so bicycle traffic can still travel over them very safely and smoothly. Chances are, though, the introduction of the cycletrack will provide better protection for pedestrians than a bulb-out would for all of the reasons that are generally cited. There are other big advantages to cycletracks over bulb-outs — really, too many to list here. I wouldn’t doubt it if bulb-outs were invented by someone from General Motors, or some self-proclaimed ‘walkability advocate’. If someone claims to be a walkability advocate, that generally means they’re trying to figure out a way to maintain/institutionalize automobility and maybe kill a few less pedestrians while we’re at it. Don’t trust them. @2c232dd069922070a01c69ae4849c3fa:disqus I agree that bulbs are good when you are dealing with cars. The clearly make it easier for cars to see you and also there is less road distance to cross. However, for the former, that can also be accomplished by daylighting the intersection (and both take away the same amount of parking). And the latter isn’t that big of a deal when you’re only dealing with bikes. If somehow we had roads that only had bikes on them (I still hope for that day), then I would agree that bulb-outs aren’t necessary. But until then, they seem beneficial to me. Bulb-outs are only bad when there is no bike lane because they force the cyclist from the shoulder out into traffic. It’s basically a pinch point with no shoulder and curbs right at the edge of the lane, so a bicyclist feels there is no where to go if they need to get out of the way of a car. However, when there is a bike lane (assuming the bulb-outs don’t jut into the bike lane, which I haven’t seen yet), then they don’t seem to cause any disadvantages to cyclists. I disagree. Cars have too much power and their operators have their senses too dulled to be rolling through stop signs. When you are not encased in a steel cage (a pedestrian or bicyclist), the Idaho stop rule works great. But it doesn’t work for cars. That is the reason stop signs evolved in the first place. You may have a point. I do suspect that their would be outrage amongst motorists if they weren’t allowed to turn right on red. I’m not convinced it isn’t worth fighting for, but you certainly have a point which I hadn’t really considered. I do think that, one day (say when most people are *not* driving anymore in our cities) we ultimately need to ban turning right on red though. Thanks Peter Smith and jd_x for your responses. I never quite thought of it from your perspective, Peter. Thanks for the info about bike improvements benefitting walkers, Peter. I think that bulb outs are useful in business districts where there are narrow sidewalks and throngs of pedestrians. They improve pedestrian circulation by separating people wanting to cross the street from people walking down the sidewalk. Of course, the same objective could also be accomplished by widening the sidewalk.